>”Encuentro” is Spanish for “encounter.” It also means “I find.” On my recent trip to Mexico I did both. I found all kinds of things, information, and insights … and I truly encountered Mexican culture, people, places, and ministries in a variety of contexts. There is too much to process in a single post, but with this one, I thought I would begin by at least putting down some of my first impressions after returning to the states and giving myself a few days to reflect, ponder, and pray. Perhaps the best way to do this for CC readers is to do some comparison and contrast between life in the U.S. and life in Mexico as it pertains to national identity, history, culture, church, and ministry. You can see this best illustrated by the picture to the right, taken in Mexico City inside the museum of the Templo Mayor, the ancient temple of the Mexica people (a more accurate term than the name “Aztec” given them by the Spanish). The picture may be difficult to discern, but the layers of history start near the bottom with ruins of what was formerly called the city of Tenochititlan, where the enormous Mexica empire was first built around 1325. The temple’s accidental discovery, in the heart of modern Mexico City, occurred in 1978 when some city workmen work digging near the old, colonial-dated cathedral found some ancient stones and artifacts. It was soon discovered that preserved historical buildings that date back to colonial times were placed directly over more ancient ruins. Today, one can literally see layers upon layers of history now visible to the naked eye. The number of layers of this history is amplified by the number of temple expansions that occurred between 1325 and the “discovery” of the great Mexica city by the Spaniards in 1519. 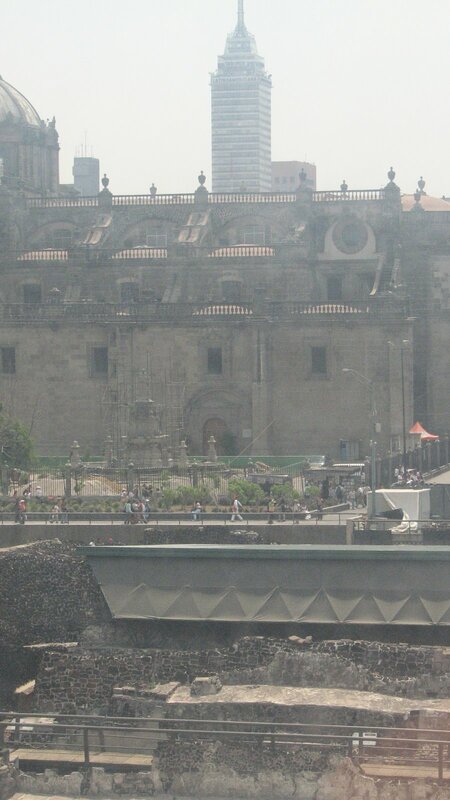 The majority of the ancient city remains unearthed and beneath the famous Mexican plaza, which includes the Mexico City Metropolitan Cathedral. So in this case, I guess you could say “a picture is worth a 1000 YEARS” – more or less – from bottom to top with a modern day sky scraper at the apex (click on the picture at the right to enlarge). But for Mexico, the presence of the past is more than stone and artifact. 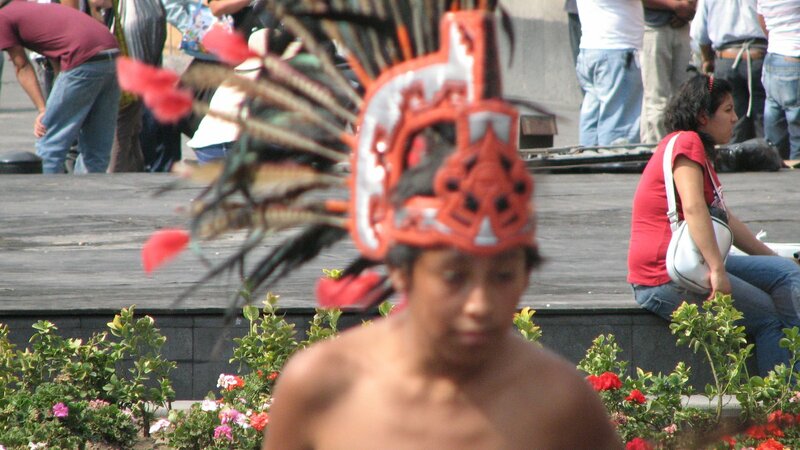 Along with modern day Mexican culture, the layers of history are palpably present in the people, the customs, the art, and even “the air” of today’s Mexico: indigenous people that descended from the ancient Mexica people are living in the cities and rural country sides; advertising and graffiti on signs and walls appear to have more than a coincidental resemblance to ancient paintings and murals; social consciousness is shaped by modernization and technology as well as native myth, folklore, oral history, and religion. For a person from the U.S., this struck me as a distinctively Mexican reality. The U.S. tried desperately to completely eradicate its native population and then relegate what was left of the people and culture to reservations with a marginalized role in the social and historical consciousness of the new “America.” Mexico is truly a different story. The text we read prior to leaving for our trip unpacks some of this even better, and I recommend it to others since it is a classic in Mexican literature: “The Labyrinth of Solitude and Other Writings” by Octavio Paz. There is so much more to reflect on: the Catholic and Protestant Church in Mexico, the role of the Virgin of Guadalupe in Mexican culture and religion (including our visit to the Basilica), Mexican Methodism, urban and rural life and ministry, and a life transforming visit to a Methodist Mission in the little pueblo of Huitzapula. Stay tuned for the rest in the days and weeks ahead.